Watercolor on Arches 300-lb cold-press paper. Quarter-sheet, 11" x 15" (28 x 38 cm). This is the finished commissioned painting for a friend, which is the final version of several barn and cornfield ideas with which I've played over the past year. 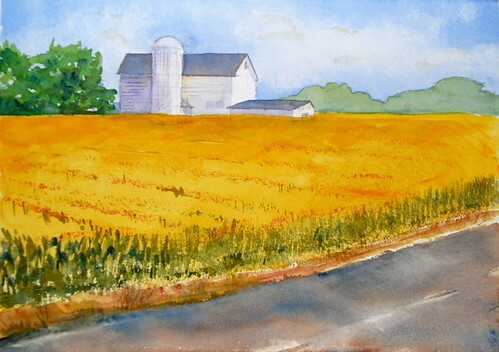 The goal was to create a scene in summer, one that you might see while driving the back roads in Illinois.